A colonial police officer (James Faulkner) in Rhodesia hunts down the albino terrorist (Horst Frank) who raped and murdered his fianc� (Sybil Danning). 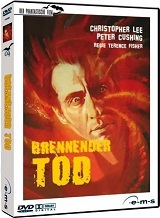 Also stars Christopher Lee and Trevor Howard. German actor Horst Frank died on May 25th, 1999, from heart failure. He was 70. Two Polish resistance men are deliberately captured and sent to a labor camp so that they can spy on scientific experiments on the buzzbomb. Stars Michael Rennie, Patricia Medina, Milly Vitale, David Knight and Christopher Lee. Patricia Medina died on April 28, 2012 at Barlow Respiratory Hospital in Los Angeles, CA at the age of 92. She had been in declining health. The evil mastermind Fu Manchu (Christopher Lee) plots his latest scheme, which is to freeze over the earth's oceans with his new diabolical device. Opposing him is his arch nemesis, Interpol's Dr. Nayland Smith (Richard Greene). 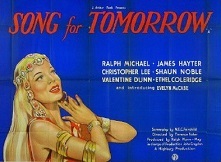 Also stars Howard Marion-Crawford and with G�nther Stoll and Maria Perschy. (Totally uncut). In 1982, British actor Richard Greene suffered serious injuries from a fall, followed by a diagnosis of a brain tumor. In the autumn of 1982, he underwent brain surgery from which he never fully recovered. He later died in Norfolk, England on June 1st, 1985. The official cause of death was cardiac arrest. He was 66. In the olden times, Count Regula (Christopher Lee) is drawn and quartered for killing twelve virgins in his dungeon torture chamber. Thirty-five years later, he comes back to seek revenge on the daughter (Karin Dor) of his intended thirteenth victim and the son (Lex Barker) of his prosecutor in order to attain immortal life. (Uncut and in widescreen format). This rare import print is 10 minutes longer than the current U.S. DVD release and is also in much better picture quality. Director Jess Franco's version of the Bram Stoker classic has Count Dracula (Christopher Lee) as an old man who grows younger whenever he dines on the blood of young maidens. 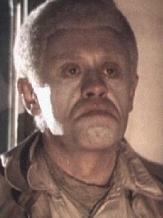 Also stars Soledad Miranda, Herbert Lom, Klaus Kinski and Maria Rohm. On August 18, 1970, Soledad Miranda was killed in a head-on-collision on the Costa do Sol highway between Estoril and Lisbon in Portugal. She was 27. Count Karnstein (Christopher Lee) sends for a doctor to help his sick daughter Laura (Adriana Ambesi). Her nurse believes she is possessed by the spirit of a dead ancestor, Carmilla. A young woman becomes intrigued by the mysterious deaths surrounding Laura after a carriage accident outside the castle forces her to stay. They become close friends until Laura becomes convinced the spirit of Carmilla is forcing her to kill. CIA agent Derrick Carpenter (Chris Mitchum) is sent to a Latin American country to remove a drug lord (Christopher Lee). Complications ensue as Derrick falls for the kingpin's daughter (Cristina Higueras). Also with Richard Harrison and Brigitte Lahaie. Telly Savalas is brought in to oversee security at a South African diamond mine after some thefts are discovered. Another security officer (Peter Fonda), is sent to lure the thieves out into the open, but instead he enlists a group of former soldiers of fortune (Hugh O'Brian, O.J. Simpson and Christopher Lee) to help him pull off the biggest heist the mine has ever seen. Also with Maud Adams. Telly Savalas died on January 22, 1994, at the age of 72, just one day after his birthday, of complications of cancer of the bladder and prostate at the Sheraton-Universal Hotel in Universal City, CA. Five strangers board a train and are joined by a mysterious fortune teller (Peter Cushing) who offers to read their Tarot cards. Five separate stories unfold: An architect returns to his ancestoral home to find a werewolf out for revenge; a doctor discovers his new wife is a vampire; a huge plant takes over a house; a musician gets involved with voodoo; and an art critic is pursued by a disembodied hand. Stars Christopher Lee and Michael Gough. While searching for Incan treasure, Mike (Robert Walker Jr.), an American pilot, crashlands in the upper Amazon region of Brazil. He is then rescued from savages by a white girl named Eve (Celeste Yarnall), who is worshiped as a goddess by the natives. When news of Mike's adventure reaches a small river port, an unscrupulous American showman, John Burke (Fred Clark), sets out to find Eve and add her to his touring sideshow. Also stars Herbert Lom and Christopher Lee. (In Spanish language). This film came from a very nice Spanish import print which has far superior picture quality than the English language version. NOTE: The last 35 seconds of this film are completely silent. This very minor issue is present in the original master print itself and not a defect in the DVD-R. While searching for Incan treasure, Mike (Robert Walker Jr.), an American pilot, crashlands in the upper Amazon region of Brazil. He is then rescued from savages by a white girl named Eve (Celeste Yarnall), who is worshiped as a goddess by the natives. When news of Mike's adventure reaches a small river port, an unscrupulous American showman, John Burke (Fred Clark), sets out to find Eve and add her to his touring sideshow. 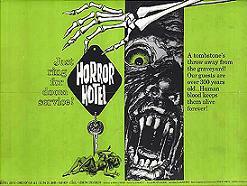 Also stars Herbert Lom and Christopher Lee. NOTE: The picture quality for this film is a bit soft and the colors are rather faded. But overall, more than watchable and currently the best English language version available anywhere.